You do not need to go over your budget to have a custom-looking wine room. You can opt for a modular wine cellar, an economical storage solution for a growing collection. In Coquitlam, British Columbia, a client of Blue Grouse Wine Cellars originally had a few modular storage racks. They wanted to create a custom-looking wine cellar by adding more modular units. Blue Grouse Vancouver created a unique and effective wine cellar design according to their client’s requirements. One of the challenges that residential wine cellar builders often encounter is finding a storage solution that will fit the client’s growing collection, budget, and space. At Blue Grouse Wine Cellars, they can overcome any challenge in wine cellar construction. With extensive experience and passion in building effective wine rooms, they were able to create a functional wine storage space for their clients in Vancouver, British Columbia. The owners originally had a few modular storage racks, which they bought from Blue Grouse. Later on, they decided to build a dedicated Vancouver home wine cellar to store their favorite vintages. So they came back to Blue Grouse Wine Cellars, and purchased more modular wine racks. The racking had to be installed in a utility space, located in the lower level of their home. The wine cellar, which has an area of 7 square feet, was designed to hold approximately 680 bottles. Your wine rack design should not only enhance your storage space. It should also suit the size of your room, the size of your collection, and your budget. With the increase in demand for unique wine storage solutions, modular wine racks are becoming more popular among homeowners. This racking solution is ideal for budget-conscious homeowners, who are planning to expand their collections in the future. Another benefit of the modular racking system is its ability to create a custom look in your wine room without breaking the bank. Investing in fully customized wine cellar is much more expensive. Blue Grouse Wine Cellars offers a wide range of high-end modular storage units. Since these wine racks are available in different sizes and designs, clients will have more options to mix and match racking configurations. 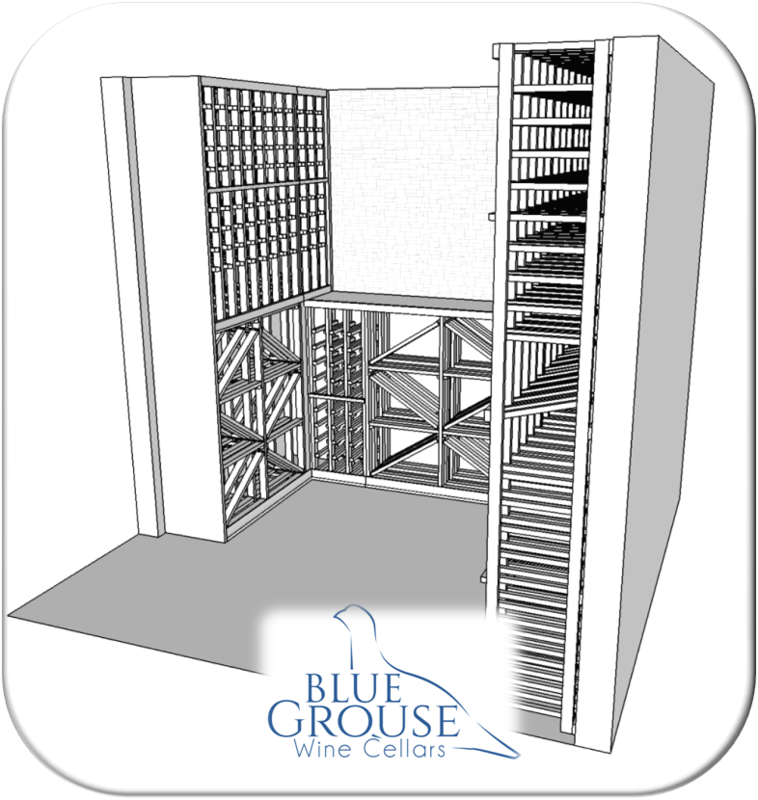 You can customize your own racking layout using the modular dimensions found at http://bluegrousewinecellars.com/racks/bluegrousewineracks.html, or you can send your requirements to blue Grouse, if you want them to create a 3-dimension plan for you. All of Blue Grouses’ wine racking modules are manufactured with master craftsmanship and quality materials. Their precision kit wine racks are suitable for collectors who are looking for a budget-friendly storage solution. Although beautiful on their own, these modular units can create a more attractive wine display when added with custom features, like top shelves, a stemware rack, an archway, crown moldings, and a stain. The Artisan Collection is a high-end modular racking system that offers custom-level quality. If you have the right tools and are willing to do the racking assembly, the Vintner Keeper Wine Racks made from California redwood are a good option. With various wood options and racking designs to choose from, it best to discuss your requirements with your chosen specialist. At Blue Grouse Wine Cellars, their goal is to create wine rack designs that will satisfy both the aesthetic and functional needs of their clients. An elegant wine storage room was created by combining attractive wine rack configurations. There are individual bottle slots at the top sections of the left and right walls. Below these sections is a horizontal display row, which runs horizontally through the middle of the racking. It features specific vintages from the owner’s collection. The lower section of the racking consists of the diamond bins, which are intended for bulk storage. The focal point of the room is the back wall. It has a beautiful backsplash, made from reclaimed wood. This eco-friendly feature adds visual appeal to the Vancouver home wine cellar. Blue Grouse also added a countertop area at the back wall, which gives a good view of the backsplash. The countertop provides a convenient space for decanting and pouring wine. It can also be used to display a few bottles, and store wine glasses, decanters, and other accessories that you want to keep within the racking. The countertop is constructed from plywood that matches the finish of the modular wine racks. Your choice of wine rack material can make or break the look of your wine room. It is for this very reason that you should seek the help of an expert. The common materials used in manufacturing wine storage racks are wood and metal. 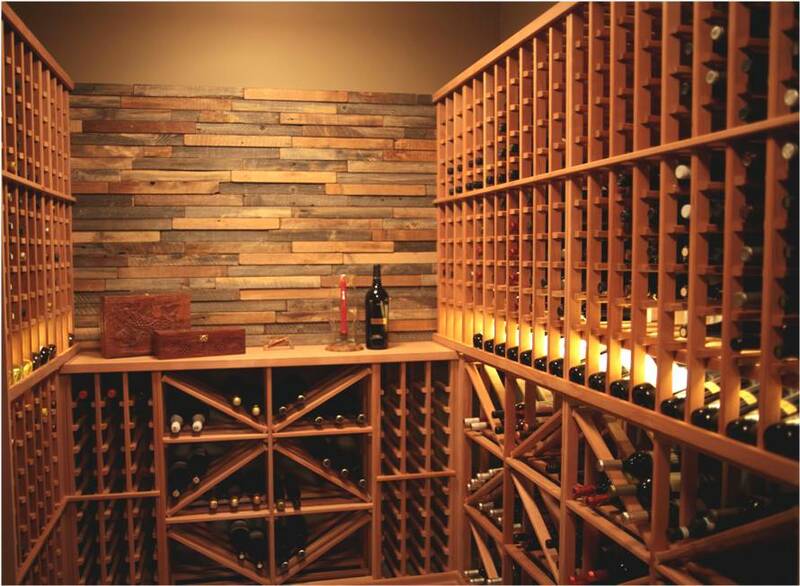 Wood is a favorite choice of homeowners who want to achieve a warm ambiance in their wine cellars. Additionally, wood is durable, flexible, and can blend well with any decor. 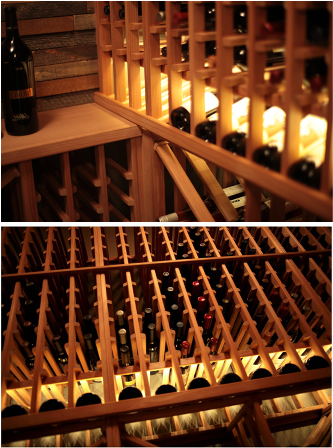 The owners chose All Heart California redwood to match their existing modular wine racks. Redwood has the ability to absorb and retain any type of finish very well. 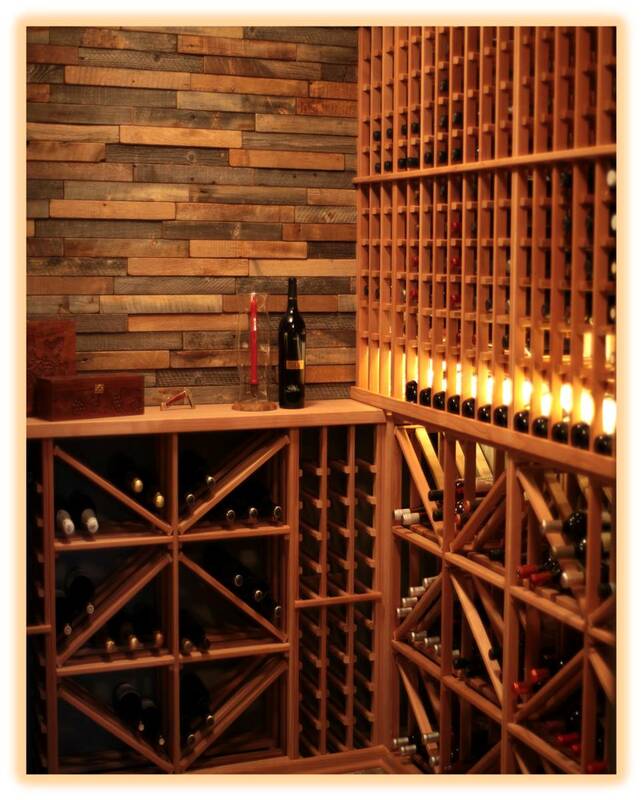 Its reddish brown color and beautiful grain patterns add sophistication to a wine room. Expect darker hues as the wood ages. 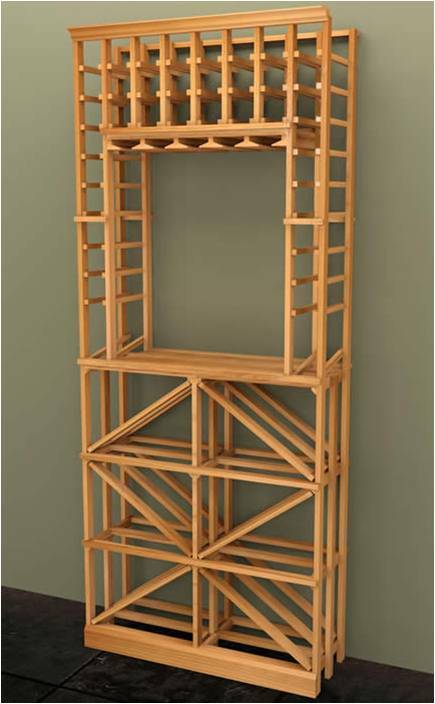 The sturdiness of this material provides redwood wine racks with the ability to withstand the humid conditions in wine cellars. Redwood storage racks contains natural wood preservatives that make them highly resistant to insects, molds, decay, warping, and shrinkage. They can last long even without staining or finishing the wood. Achieve the Look of a Custom Wine Cellar. Contact a Professional. Choose a modular wine rack system to build out a full California home wine cellar. With a master builder, like Blue Grouse Wine Cellars, you can have a custom-looking storage space without having to spend more. 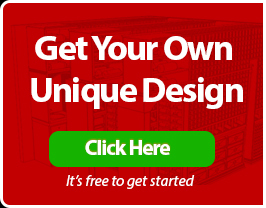 Request a free 3D modular racking design today!